Escape the frigid cold of winter with a weekend of fun! FMCC is THE premiere comics event between Minneapolis and Seattle! Fun for all ages, family friendly daytimes and extra fun at night… Celebrate all things fun… all things comics at Fargo-Moorhead Comic-Con! DOORS OPEN 10am Saturday Feb 23rd! FMCC admission is the best deal around! SATURDAY DAYTIME PASS: $7 Adult; $5 6-12 yr.; 5 & under FREE! SUNDAY ALL DAY (10am-4pm): $5 Adult; $3 6-12 yr.; 5 & under FREE! ALL WEEKEND COMBO PASSES: Adult $10; 6-12 yr. $6; 5 & under FREE! Panels! - Learn about the many different aspects of comics from gaining entry into the comic world, collecting comics, comics in the media and even how to draw the characters. Demonstrations! - Check out demonstrations at the event. Many different areas of comics may be demonstrated from including but not limited to drawing, inking, coloring and maybe even airbrusing or other specialized areas. Media! - Come see the different areas of media that are comic related. There will be video shorts, movie previews, and possibly other video related resentations. Creators! - Meet the artists involved with creating your FAVORITE comic book characters! A variety of genres are represented at FMCC so come see them all. Cosplay! - Whether you buy a pre-made costume or spend countless hours building a costume from scratch, we have the cosplay contest for you! Opportunities exist to win prizes just for wearing your costume around the convention. Larger prizes during the official cosplay costume contests where cosplayers are judged by a panel of judges on accuracy, craftsmanship, originality and performance. The Event Poster has been Released! Click on the image below to download the current event poster. Check out FM Comic-Con in Local Media! 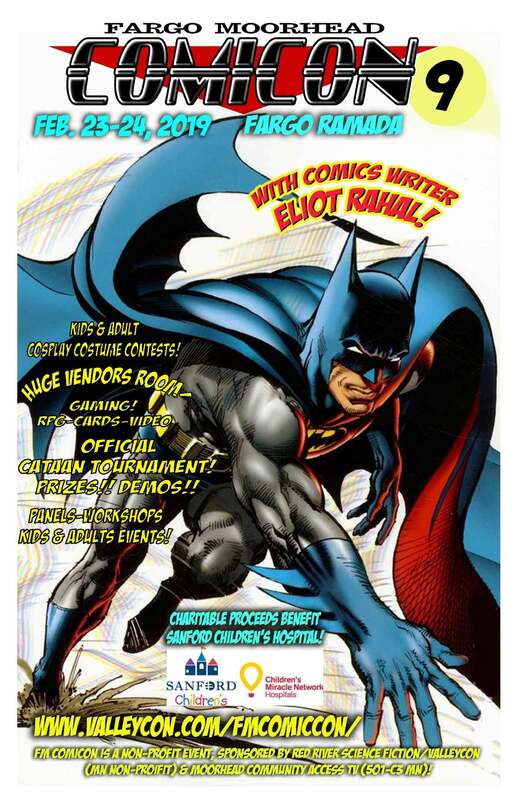 Nighttime Live with Bob Harris - Feb 23rd 2015 - Tony Tilton the man behind Comic Con 5 gives us the scoop on this 2 day event coming up this weekend at the Baymont Inn and Suites.